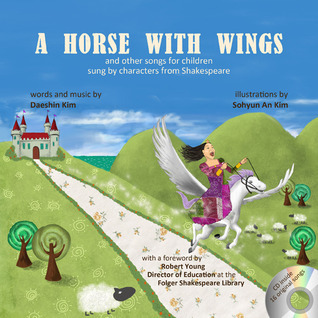 "A Horse With Wings contains sixteen original songs and pictures for children, composed and illustrated by Daeshin Kim and Sohyun An Kim respectively, a husband and wife team. Each nursery rhyme is 'sung by' a character from Shakespeare - for example, Hamlet sings about his dear departed friend Yorick, and Juliet wonders what's in a name. Each song also addresses a specific issue with which children can identify, whether it be about rivalry, bullying or simply about the smelliest dog in the world. The Kims' young daughter Sherman also sings some of the songs." Although my kids are a bit young to appreciate the text of this book fully they did enjoy looking at the details of the illustrations. The big winner was the CD. Both of my little ones loved it! The songs really brought the book to life. "Smelly dog" was my 5 year olds favourite and had him in a fit of giggles. A nice way to subtly introduce kids to Shakespeare.